What can you get from the demo though? If you own a Switch, I do firmly believe that you should go and download and try it out. 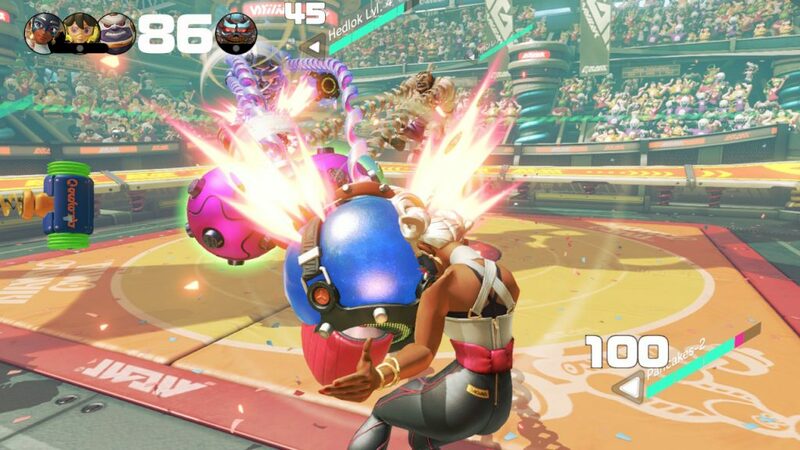 The Testpunch offerings only last about an hour and do a decent job showing off the combat. Did it sell me? Let me break it down for you. 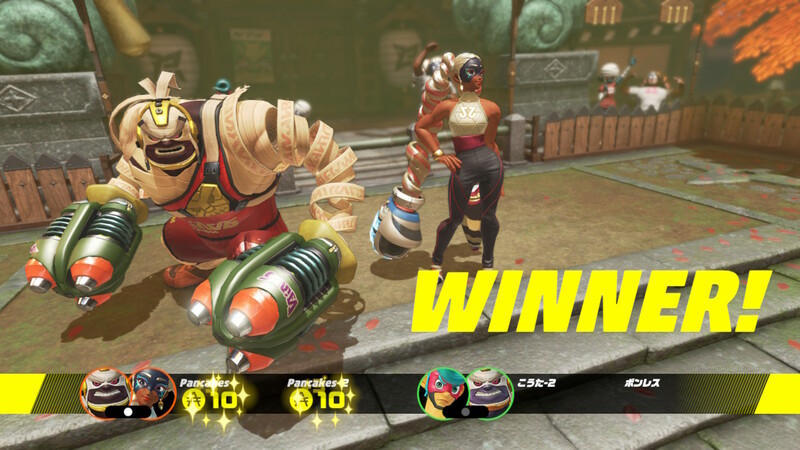 Standing tall with my wife after a solid victory. One thing that I didn’t notice was the control confusion if you plan on using a controller like the Pro or the Joy-Cons in the controller you get with the Switch itself. It’s a punching game so I naturally (because punching things is cool) went with the fist-pumping mode of controls. 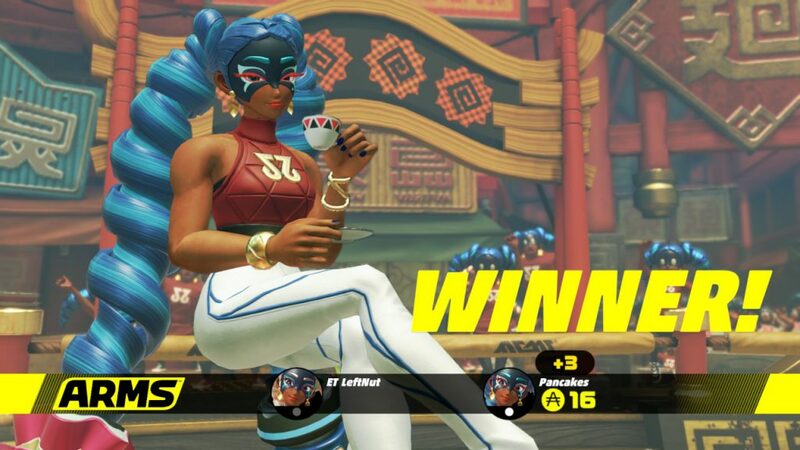 If you wanted to not make any effort while playing ARMS, you can do so, but there is no tutorial for you. Know that going in, you’ll have to make a small effort to get past the physical version of controls to get to the controller varieties. It’s also worth your time to go to the help menu and figure out what the buttons do to. I think this is a good idea though. I’ve done both and I have to say that the motion controls were more fun… even if I’m a little sore. If you’re not going to show off much, make sure what you do is fun. I spent a lot of time getting to know the scent of other people’s gloves. I played with my wife and was planning on playing around with my kids as well because I thought it would be a good wholesome family activity. You know, getting together and punching the junk out of each other? Quality family bonding time! However, that’s not how the Testpunches are set up. 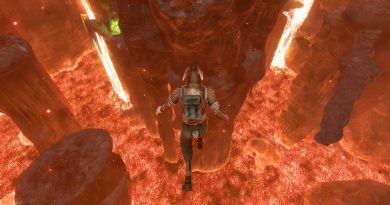 You are teamed up with your second player partner, but will only fight each other if there is no other person available for a small amount of time. You are randomly matched up with others and will either beat each other up or play a few mini-games (all with punching, but more or less focused on other tasks). I believe I get why they are doing it this way. They are probably trying to maximize the number of people playing online at the same time and playing the same game mode so there will always be someone to play against instead of coming online and having a hard time to find an opponent. I get that, but that’s not what I wanted to do, but we were more than happy to put our fists into the ring. I do believe that is me rubbing my face in the mat. Double Min Min for the lose lose. Was it any fun? Well yeh… kind of. We won a few rounds and lost more. We seemed to be up against a bunch of people who were in previous Testpunches and got better acquainted with the controls than us. We did win a few rounds, but were mainly man-handled into submission. Like I said, we did win a few rounds and when I went solo I’d say the ration was about 50/50. The mini-game modes didn’t go very well for me though. There is a mode where you punch targets that pop up between the two teams (pictured above without the targets because I was finished losing), another where you throw your opponents into a basketball hoop (by far my favorite even though I wasn’t a big fan) and the last that I can remember is one where three people face off against Hedlok which basically looks like a beholder. 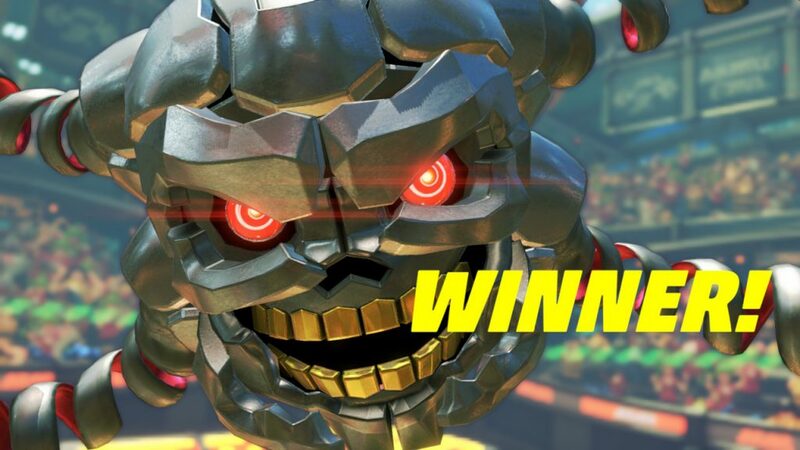 Here’s a picture of Hedlok just in case you don’t know what a Beholder is. And yes, he did just beat us up. He’s kind of a jerk. I did manage a team win again him once out of the four times I fought him. I have a buddy that couldn’t manage to pull out a win and I can understand why. I prefer the straight fights to any of these mini-games. While they weren’t convoluted, but I don’t think the controls stand up to me wanting to be as precise as I was trying. No one throws a punch like the straight punches in ARMS. I had to fight turning my punches like I normally would to not curve them in-game and completely miss. Even when I did, I’d see punches simply miss or grabs go right through opponents. There will definitely be some finessing to be had by me and probably some others who had similar or worse luck than I did. There are a few different options for gloves/weapon types to help with people who aren’t very accurate. Why do they all wear masks? I don’t think they were burned by acid or something, but more likely that they are terribly comfortable and we’ll probably all be wearing them in the future. I’m torn about ARMS. I was getting excited about the game as more and more information was released. When I finally got my hands on it, I couldn’t play with my friends only. 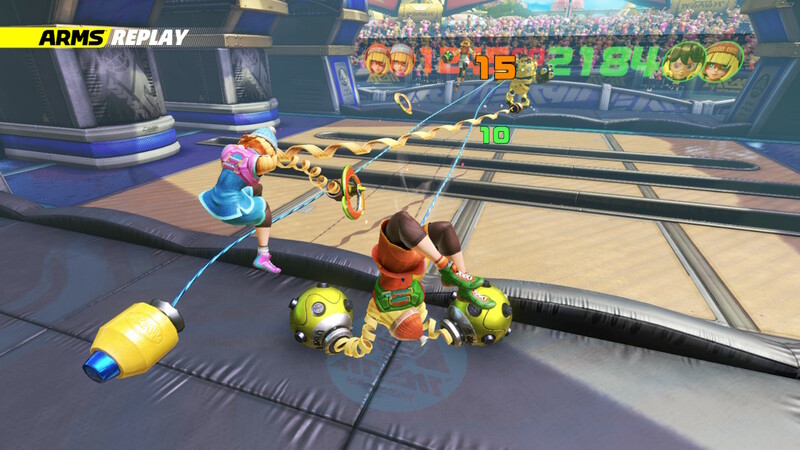 I understand the point of the Testpunch, but that’s not how I was planning on playing ARMS in the first place. There’s talk of people wanting ARMS to be an eSport… I’m not really feeling that personally either. I would totally watch it, but I’m not a big fan of playing that. Maybe, just maybe, if there was a “local” option available, I would have had more fun and been more excited. While I know that there will be such options when it launches, it did leave a rather bland taste in my mouth and am firmly in the camp of “waiting for a good sale” to pick ARMS up. $60 (or less if you’ve got Amazon Prime) is a bit of a high asking price. I’m thinking $20 or $30 and until then, I’ve got other games that I can have fun with currently. Punching my wife and children in a videogame will have to wait. ← (Impressions) Post Human W.A.R.